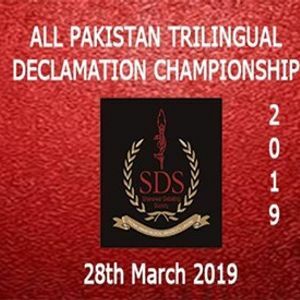 With the advent of 2019, Shanawar Debating Society brings you the Shanawar All Pakistan Trilingual Declamation Championship. 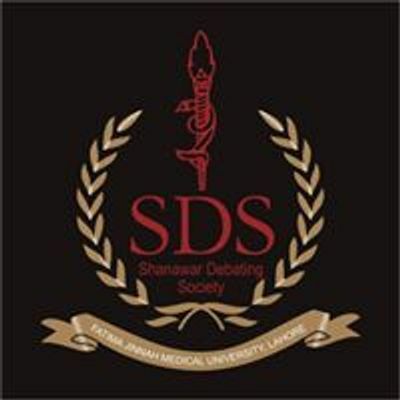 SDS has maintained a precedence of organising eminent events with a litany of excellent speakers as well as adjudicators. This year, we bring you another opportunity to exhibit your potential as a speaker on the very renowned platform of Fatima Jinnah Medical University. The topics for the event have been announced. Stay tuned for further updates. 1. The competition consists of a single, one day round. 2. The contest will be held on a team basis. Each institution is to be represented by a team comprising a minimum of 2 speakers, 1 for English and the other for Urdu. One of the speakers is to speak on a serious topic and the other on a humorous one. 3. 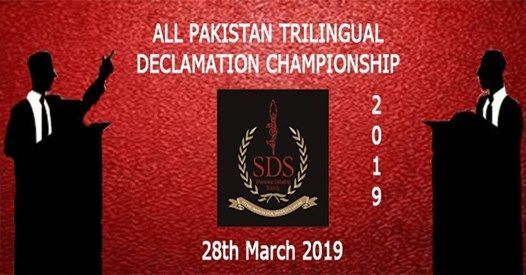 Punjabi speaker is mandatory for a team to compete for the team trophy. The choice of topic, serious or humorous, is left to the speaker. For the English and Urdu speakers of the team, rule 2 stays valid. 4. Individual speakers will not be accommodated. 5. Delivery time shall not be less than 3 and more than 5 minutes. Inability to abide by the rule will lead to deduction of speaker points. 6. Paper reading is prohibited. Those who violate the rule shall be penalized. 7. Speakers will be assessed by a panel of judges who will base their decision on the content of speech, pronunciation, delivery style and textural accuracy. The team garnering the maximum aggregate points after adding up English, Urdu, and Punjabi speaker points shall win the team trophy. 8. Decision of the judges shall be final. In case of any dispute, the team chaperone can lodge a written appeal to the management. 9. Three best speakers from both Urdu and English, and two best speakers from the Punjabi category will be awarded prizes. All participants shall receive certificates of participation. 10. No speaker is permitted to make derogatory remarks about important personage, religious / sectarian / racial / political groups & state institutions. Using words/sentences with indecent or vulgar connotations, casting aspersions upon other speaker and passing derogatory remarks about the Chair will lead to immediate disqualification of the speaker. 11. All the participants are required to bring their CNIC, college ID cards & authority letter with them. 12. Teams are requested to follow the schedule. Those who fail to comply shall not be entertained. Please note that due to time constraints and the tough medical university schedule, the timings will be strictly followed. 13. Out stationed teams will not be provided accommodation. We look forward to hosting you on the 28th!